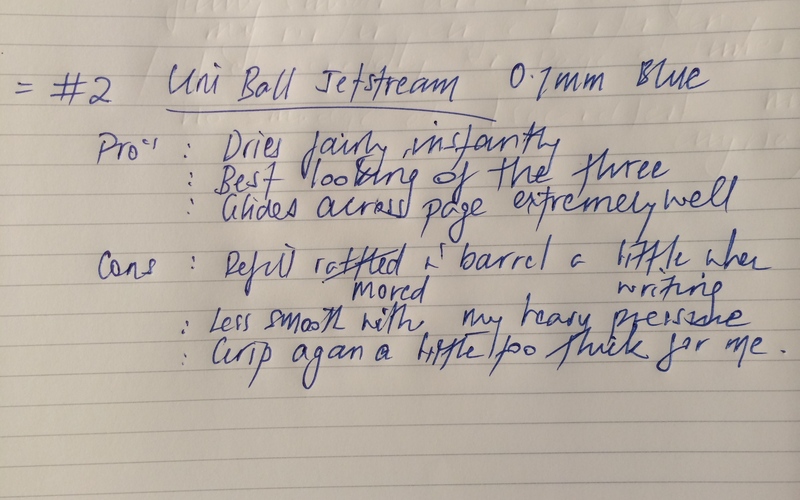 More than a little discussion, both written and verbal ensued after the publication of this Wirecutter article concluding the “best pen” (read – “the best affordable pen around for taking notes at school or a meeting”) is the Uni-ball Jetstream. In addition, my wife had recently started using one and absolutely loves it. The article itself was published in September this year, and upon reading it and hearing my wife’s feedback, I began to wonder why the 4 pack I purchased at the beginning of the year remains unused. Does the Jetstream have a place in the list of pens I prefer to use? The short answer is no, though it would seem reasonable to explain why. It’s worth noting the segment of use we are talking about here. This is an everyday pen – one that you don’t mind lending and ultimately losing if it comes to that. An office supply type pen – not your bargain basement sub one dollar pen, but a cheap one nonetheless, at under five dollars. We are clearly not comparing this pen to those in medium to high price ranges. For a reasonable comparison, I picked up a blue rollerball ink 0.7mm Jetstream and a couple of other retractable gel-ink pens, the Pilot G–2, and Uni-ball Signo 207, spending a few weeks rotating between each. The conclusion? I prefer the Signo 207 over both the G–2 and the Jetstream – for very different reasons. So is the Jetstream really the best pen? The answer is probably yes as a recommendation for others – just not for myself. A little background on my use first. This varies greatly depending upon what any particular day brings. The office I work in utilises a “paperless” approach, in that much of what I hand write is an initial or signature on the few pieces of paper which are produced and come across my desk to sign. Longer form writing occurs with meetings and telephone calls, for I am not capable of typing quickly enough to capture the necessary information electronically for either. The paper? This varies between your standard copy paper for any printed documents (initialed or signed); a cheap office supply spiral bound A4 ruled notebook (telephone calls and general scratchpad); an extra-large ruled Moleskine Cahier (idea or ‘spark’ journal); a Moleskine Large Squared Softcover notebook (meetings); and finally, a Field Notes notebook – currently the Night Sky Edition (for random thoughts or anything else). As with most of us, my choice of pen is based on numerous factors. The look (overall aesthetics, design, colour) of the pen; the functional fit and feel in my hand (overall weight, distribution, thickness and length); the performance (ink flow, smoothness, skipping, boldness of line, feathering, bleeding etc); suitability for the variety of paper types I typically use in a day; and whether or not I look forward to using the pen – does it make me want to pick it up when I have something to write. Listing the criteria above is a curious endeavour. Do I have a list of check boxes for each of the above in determining whether or not I like a particular pen? Not at all. For someone who is a little obsessed about what they write with, you would think this would be the case, however it is probably only when writing about what I write with that the delineation of these characteristics becomes more relevant. After already letting the cat out of the bag above, you know the Jetstream doesn’t come up trumps for me. As far as looks go, firstly, I find the G–2 to be a pretty ugly pen, whereas both the Jetstream and Signo 207 are quite well designed, with the Jetstream probably looking a little more “premium” overall. In considering the feeling in my hand, here the G–2 does win out. I have always preferred a slight taper where my index finger sits on the grip section of the barrel. Both the Jetstream and the Signo 207 have no taper and the Jetstream appears to have a slight increase in thickness nearing the lower end of the grip (as an aside – is that an un-taper, de-taper or even an a-taper? – anyway, it gets ever so slightly thicker). So the winner here is the G–2. 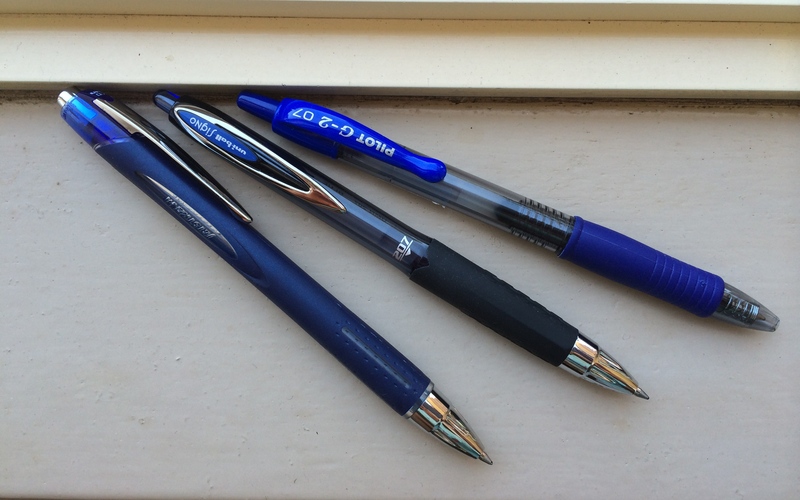 Although I have compared three different pens over the course of the past two weeks and collected my thoughts as indicated above, personally, I don’t really think there is a clear winner. I can certainly see (and mostly agree with) where the conclusions drawn in The Wirecutter article are derived, and for most I think the Jetstream would be a fine pen. I would also have no problem recommending the Signo 207 if asked (though I rarely am). The only one of the group I would not recommend is the G–2 – not for long form writing anyway. 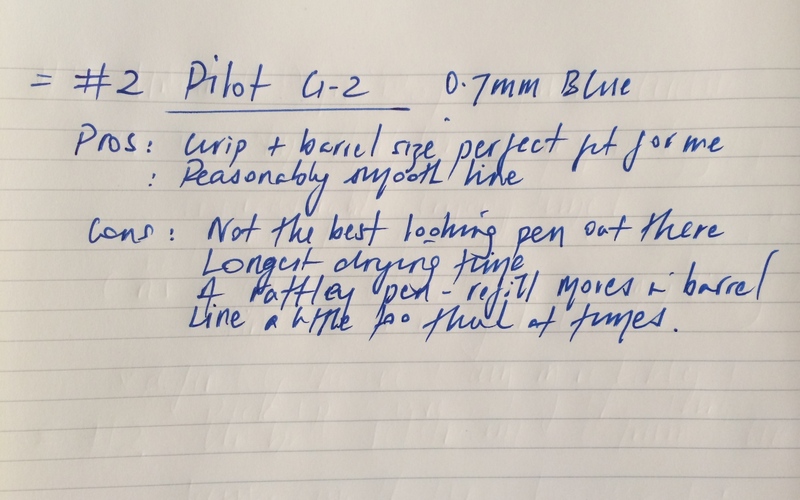 To summarise why, firstly, apart from the shape of the pen which suits my hand and writing style, there are not too many redeeming features I see in the G–2. 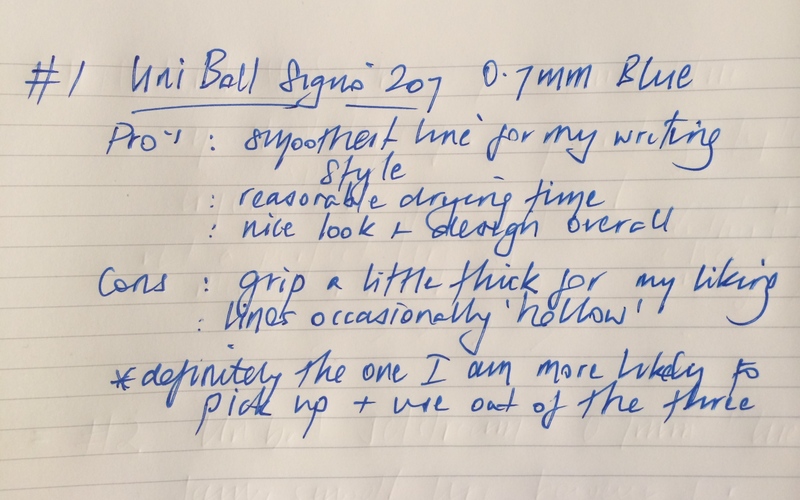 The Signo 207 and Jetstream are fairly close, however I cannot write for any length of time with the Jetstream, which I believe relates more to my style of writing then the pen itself. I tend to press heavily when writing and use quite an angled pen position, so without a fairly heavy ink flow, things feel pretty scratchy pretty quickly. In thinking back, this is no doubt why I have always used rollerball and gel ink type pens, along with the fountain pen I wrote about in a previous post. This combination of writing style and the Jetstream do not quite mesh, and it often felt as though it was too much effort to push the pen across the page. Notably, this improved markedly with better quality paper and lighter pressure, though the paper I use is not always of this quality, and that is not the way I write. The Jetstream also produced a much finer line than the other two, so it could be suggested the 1.0mm may be a better fit, however I recall using one a little while ago and finding the same issue. On most occasions when the three pens were available in front of me, the default selection was the Signo 207 – it was the one I wanted to pick up, and hence was the winner in this comparison. There is always one caveat to reviews or comparisons such as these, and that is to remember this is my perspective, based on my writing style and use case – yours may be very different. My advice? Pick up a couple for yourself and give them a run (I’d go with the Signo 207 and the Jetstream in varying sizes). It certainly won’t break the bank, and you may find yourself with the best pen – for you anyway. Me? I am still on the journey to find mine, although in the mean time I will revert back to my trusty Retro 51 Stealth Tornado and Kaweco Sport. FYI, Bic/Pentel/Pilot/Uniball Gel refills are nearly identical. Jetstream refills are the same length and narrower, but the spring stop is designed so that it fits a gel pen body. You can easily just put a Jetstream or Signo refill into a G2 body. Or a Bic Velocity Gel body (semi-triangular grip). Or a Pentel Energel Alloy body (metal barrel). Zebras use a different size refill, unfortunately. Appreciate the information. I had considered hacking around with some of the refills given my conclusion was a bit of a mix, however thought I’d leave them as standard for the post. Must admit I hadn’t considered the Bic or Energel barrels though – I’ll check them out. You should try zebra pens you like metal bodies that is. Try the zebra 701, 401 or 301. They’re not gel pens like the jetstream or g2, they’re ballpoint; but since you press down hard onto the paper (based on the pics), the ballpoint will do well for you. Hi Adam, I am currently using a Zebra Sarasa Clip which I find quite good. I’ve not tried the models you mention and must try them out. Thanks for the tip!